SPECIAL NOTE: Just to get this out of the way up front: there are any number of perfectly valid ways to send plants through the mail. I am describing a way that works and is convenient for me, but it's not the only way, not by a long shot, and persons who have mailed me plants in the past should not interpret the instructions which follow as an indication that they did a bad job packing. First, you will need to try to determine whether you even can send plants through the mail. If you're not a business, you probably technically can send anything wherever, but some U.S. states ban the import of plant material and/or soil from certain other states. Shipping citrus fruit to California, for example, is a no-no. I've located California's list (it's the only one I've needed to find so far), but some of the other western states have similar restrictions. For what I'd hope would be obvious reasons, sending plants known to be invasive in the state you're sending them to (i.e. mailing Ardisia elliptica to Florida), or plants which are diseased or infested with insects or other pests are bad ideas also. I asked the Postmaster here about mailing stuff into states with quarantines, and she said she honestly didn't know what happened in those cases: she was sure they would run packages by drug- or other-contraband-sniffing dogs at some point, and maybe also x-ray them, but unless there was reason to think that there were drugs, banned plant products, or other contraband in the packages, she didn't think they were ever opened. So it's quite possible that you could send kumquats to California and get them in anyway. Which makes it all the more important that you try to find out what would be harmful: these restrictions are in place for a reason. If you send a diseased kumquat to Los Angeles and it destroys their whole citrus crop, guess who's paying more for orange juice at the supermarket. Other countries are a much more complicated situation, and I'm not clear at this moment whether it's possible for me to, say, ship a couple houseplants to someone in Canada or Mexico. (I'm pretty sure anywhere else in the world is out of the question, if for no other reason than it would take a really long time to get there and/or be prohibitively expensive.) I'm working on finding out, especially with regard to Canada, but if anybody happens to know the answer already, or where I could find the answer, please leave a comment. In the U.S., they'll ask at the post office if what you're mailing is perishable. (I'd hope that other services like UPS and FedEx do this as well, but I don't know.) I always say yes, and that it's plants. I'm not sure what this actually means in terms of how the box is treated within the postal system, whether your box is actually kept somewhere with moderate temperatures or just gets thrown in with everything else anyway. So if it's going to be very cold along the route, or if the plant may have to sit outside in the sun for a few hours on a hot day, you're probably best to wait and send it later. I usually (always?) send stuff between April to October. Cold is more of a problem for most tropical plants (i.e., houseplants) than heat is, but extremes of either can be fatal, so think first. Then you'll need a box. 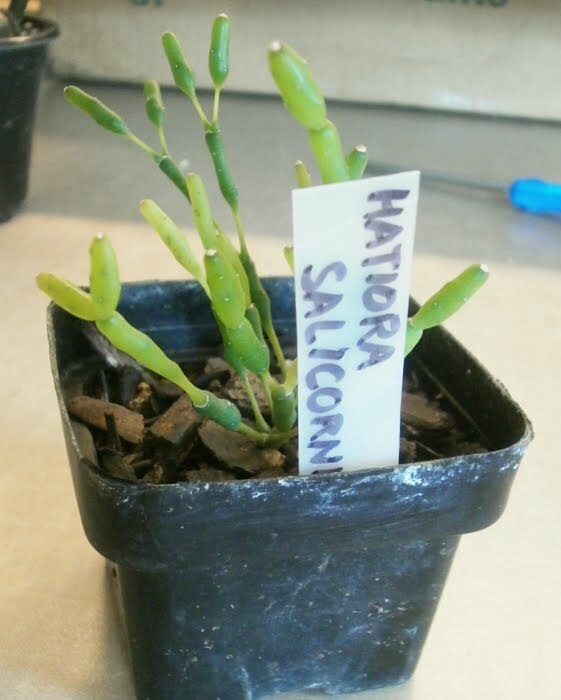 For small items, like a single Kalanchoe leaf, you could use a padded envelope, but even for small things I prefer the added strength of a box. I don't know what sort of machinery envelopes get put through. If the recipient already knows what they're going to be getting, then you don't really need to include a list, or ID tags, but it's neighborly to do so anyway. Next, I line the bottom of the box with some packing material. In the past, I've used shredded paper, crumpled paper, styrofoam peanuts, and plastic bags, to various degrees of success. 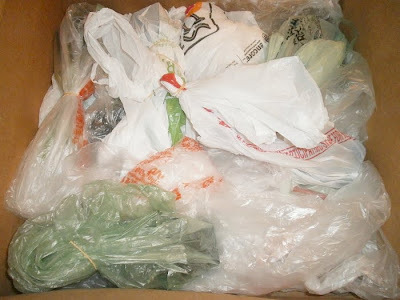 I think I prefer plastic bags, now that I've tried them all a few times, but the particular material isn't that important. The idea is just to have a layer of something that will stay between your plant and the edge of the box. This will protect it somewhat against temperature swings, as well as some kinds of mechanical damage. and then put all that into a second bag and rubber-band it far away from any plant parts. The second bag is not strictly necessary, but in this particular case I wanted to make doubly sure the soil was contained. 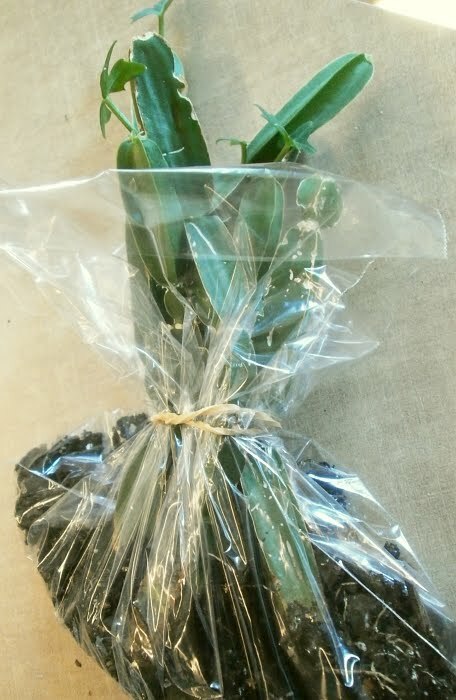 Some mail-order sellers will insert two bamboo stakes into the soil, to hold the bag up away from the plant and protect against crushing forces against the top of the plant. It shouldn't be necessary in most cases. 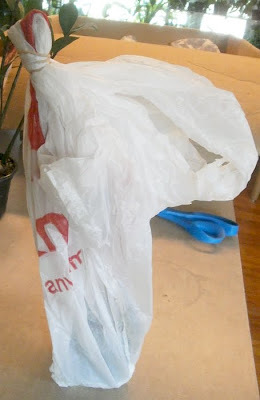 Some people, instead of bagging the plant, put packing tape over the top of the soil, or fold aluminum foil up around the edges of the pot, to hold the soil in. 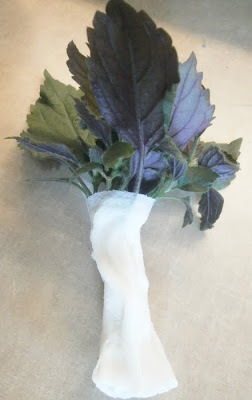 Those both work, though I don't do them because: tape is hard to get back off, afterward, and sometimes it sticks to the plant or the packing material and has to be peeled away carefully, and aluminum foil runs a slight risk of injuring the stem. If they're all you've got to work with, then by all means use tape and/or foil, but try to avoid it if you can. Also I should probably note here that professional plant-shippers tend to stick a wad of shredded paper around the top of the soil and then use packing tape to tape it down to the pot. Again, sometimes getting the tape back off again can be a problem, but it is probably the best way of keeping the soil in place, if that's a major concern. Anyway. Then the bag gets set down on top of the cushioning layer of stuff you put down first. If you're going to attach a piece of index card with an ID, now's the time to do that. the process is basically the same, though I used a sandwich bag to first wrap some soil around the roots before bagging the whole plant up. Again, tying a rubber band on -- not so tightly that you hurt any stems, but tight enough that the soil's not going to shake its way loose -- can be helpful. Not reliable on its own, but helpful. -- and then rolled the bag up around it. 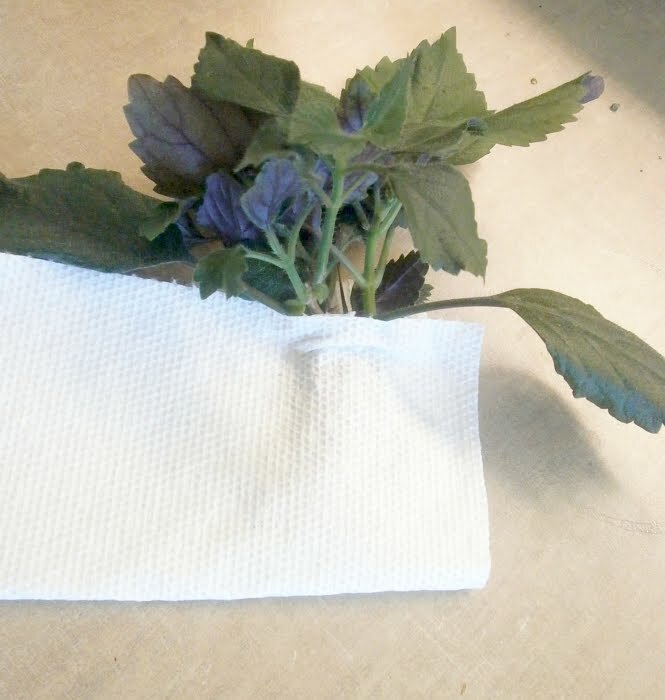 Fold over the loose end with no plant or soil in it, and tie it down with a rubber band like in the first example, and then it's done too and can be set on the pile. Try not to put plants directly on top of one another if you can help it: you don't want a carefully-packed fragile plant to have a heavy pot resting directly on top of it, and since the box is going to get spun around during shipping, you don't know what direction "on top" will be at any particular moment. For this box, I did try to do a sort of lasagna-packing approach (layer of bags, layer of plants, layer of bags, layer of plants), but I don't usually if I'm working with a small box or limited number of plants; I just try to jigsaw them all in there together in a way where they can't move around much. You may be wondering about watering. 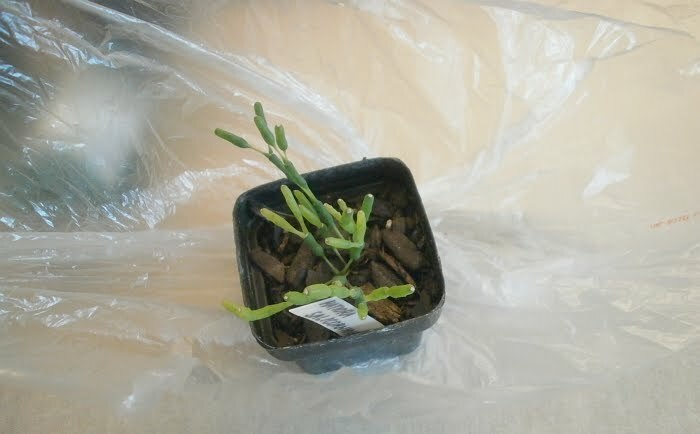 Generally speaking, if the plant is okay when you put it in the box, it's going to be okay when it comes out of the box too: it's dark in there, so it's not going to lose a lot of water to evaporation, and transpiration is reduced simply because there are so many layers of plastic standing between your plants and any dry air that might be outside the box. Another good reason not to water before mailing stuff, unless you really have to, is that the price to mail your box will depend partly on weight, and wet soil weighs a lot more than dry. (With the U.S. Postal Service, the destination zip code and dimensions of the box also factor into the cost, FYI.) So it costs you to water first, too. If the plant really is dry, you can also just dribble a little bit of water in and then seal it all up. It's not a good way to water in general, but these are exceptional circumstances. I should possibly take this moment to mention also that a lot of plants like Sedum morganianum, Echeveria spp., Pachyphytum spp., Crassula ovata (jade plants), Saintpaulia cvv., Begonias, etc., are likely to break apart to some degree during shipping even if you're very careful about how you do it. Generally, the plants that tend to shatter also tend to be pretty easy to start from the pieces, so it's not a huge loss, but you should warn the recipient in advance that this will probably happen, because otherwise they may open the box and see a shattered Sedum in there and think it's dead, or be angry with you, or whatever. Echeveria leaves sprouting new plants at work. As a final example, we have some Plectranthus 'Mona Lavender' cuttings. These were just cut, so they'd be as fresh as possible, but I still had to do something so they could ship without drying out. and then rolled the whole thing up. 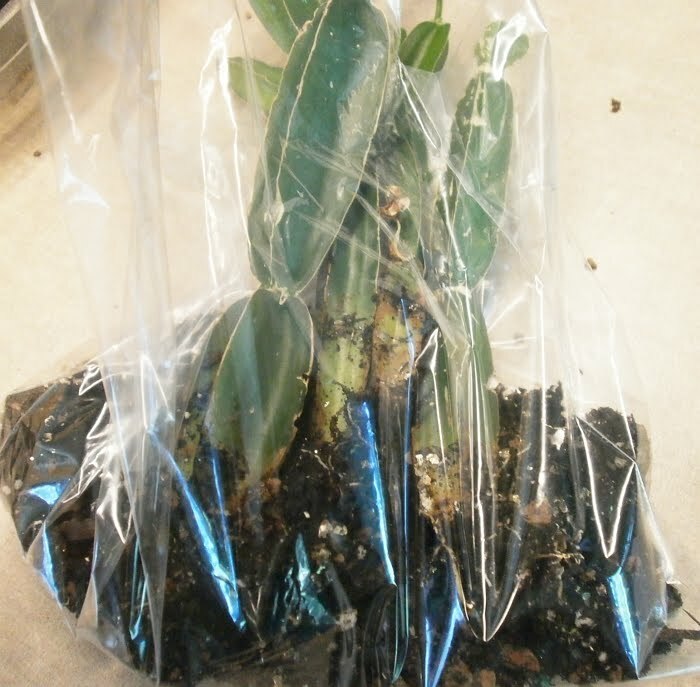 When all your plants are in the box, you should still have a small layer of space available to put packing material on the top, bags or whatever, before closing up the box. I use packing tape to close up the top, and then often put packing tape along all the edges of the box too. This is mostly because I'm neurotic and enjoy taping things, but some of it is also so that if I've done a bad job and soil does start rattling around inside the box, at least it's not going to fall out through the edges and seams and leave trails around the Post Office. If you've packed the box well, you should be able to pick it up and spin it around without hearing or feeling plants shifting around a lot inside. If you do hear or feel this, you probably should re-open the box and add more bags (or whatever you're using to pack); every shift is a chance for damage to happen, and your box is going to get thrown around a lot before reaching its destination. Too much packing material, on the other hand, is just going to push against the plants and add to the shipping weight, so try to add in just what you need to keep it from shifting around, no more. Then you can address your box and take it to the post office (or wherever). I personally try to send all my plants out on Monday or Tuesday, so as to minimize their chances of sitting unclaimed in a closed post office on a Sunday. It also seems to help them get to their destination faster if they're sent first thing in the morning, though that's a lot harder for me to do than the Monday-Tuesday thing, and may only be true for Iowa post offices or something. Boxes sent by Priority Mail (first class), through the USPS, generally take three or four days to arrive, though I've had a couple arrive in two. Third-class mail is significantly cheaper, but it's also slower (five to ten days), so I don't recommend it unless you're sending exceptionally sturdy plants that won't mind being in the dark for a week and a half. You should instruct your recipient (if they don't already know) to open the box and let the plants breathe as soon as possible on arrival. 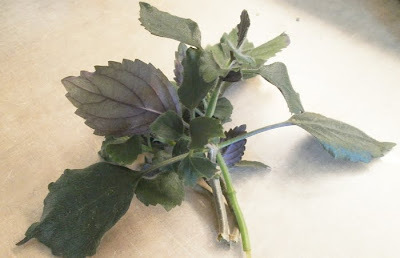 It's not necessarily an emergency if they don't pot up all the cuttings and stuff right away, but staying longer in the box without light or fresh air isn't probably going to do them any good, either. So that's my advice. Contrary opinions or experiences, questions, or comments are welcome. Also this was written quickly and without a lot of proofreading, so if you catch any redundancies, typos, misdirected links, etc., I'd take it as a kindness if you pointed them out. Very interesting post. And thanks for your disclaimer in the first paragraph -- otherwise, I would have taken it personally! As I scanned the California list that you linked, I came upon "All soil, nursery stock, or plants with roots, except as provided" which seems to me to rule out pretty much anything. I've always declined to trade plants with Californians because of that. My Post Office snootily told me that live plants are not what is meant by "perishable." But I do write all over the box, in multicolored markers, LIVE PLANTS/PROTECT FROM DIRECT SUN. So far, I've had no complaints. You didn't mention two things that I have found hugely helpful. The first is that the Post Office will provide free Priority Mail boxes in many different sizes, including some long triangular ones that are superb for shipping tall plants, and they will deliver said boxes to your house. No wonder the PO is going broke! The other thing is that you can set up an online account with the PO and create all your own shipping labels with postage included. You get a small break on the shipping price, but the best part is that you can just drop your package in the mailbox and don't have to stand in line at the counter. Great info! I've never had to send away plants but have wondered about how to go about it. I've had negative experiences with shipping stuff wrapped in plastic. Namely, on non-priority shipping, stuff sent to me tended to rot. 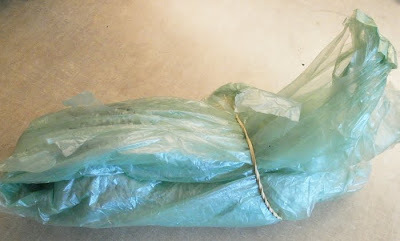 One way that's worked for me was bare-root shipping, with plastic baggie (tied loosely)+ a moist paper towel (unless the plant's succulent) over the roots, and a wrap of newspaper over the foliage. "All soil," etc. wouldn't apply to you, though, since you don't live in any of the listed states in the middle column. The one that would apply to you would be the one further down, about Japanese beetle ("Soil, growing media, humus, compost, manure (except commercial); plants with roots in soil, grass sod; crowns, bulbs, corms, tubers, etc. with soil; and any conveyance capable of harboring Japanese beetle."). Though if I'm reading it correctly, you could still send stuff to California bare-root. Plants can perish, can't they? Why wouldn't that count? Maybe your post office will deliver Priority Mail boxes to your home, but mine won't even deliver the mail to the house, so. How does the make-your-own-shipping-labels thing work? I mean, if you don't have a postal scale to weigh your box, how do they know how big it is? With non-priority shipping, I'm not surprised, though I don't know if I'd blame the plastic. I suppose that's a valid point, though -- if you know it's going to be in the box for a long time, then wrap it in something that will breathe, and plan for more moisture loss. 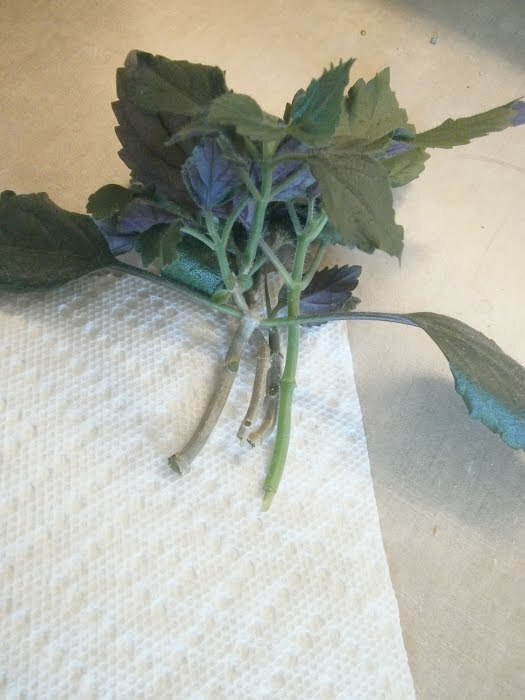 I have successfully shipped Saintpaulia, once, but in my case it was a very small plant already, in a round pot: I just put the plant on its side and carefully rolled a piece of paper around it to make a protective sleeve and then filled the top of the sleeve with shredded paper so it couldn't shift around in there. It looks like Violet Barn adds some other steps to that (and I'm impressed with them for it), but it can be done with less. 'Course, that was also a common as dirt, plain blue-flowering variety. If I were sending fancy, less-replaceable plants like Violet Barn does, I'd want to take some extra steps to protect them too. I can't speak to terrestrial plants, but this is just like the method I use on my aquatics. They go bare-root in a soaked paper towel (soaked, because if the humidity drops too much, they're inclined to exercise their perishability) in a plastic bag, rubber-banded at the top and blown up as tight as I can get it. The paper towel and bag protect the plant somewhat, and if it's something really fragile, I'll roll individual stems in paper towels, bag them very gently, and then put the bag inside a tea tin (like the long ones from Zhena's) inside the box. I'm glad to know that this works on terrestrial plants, too! 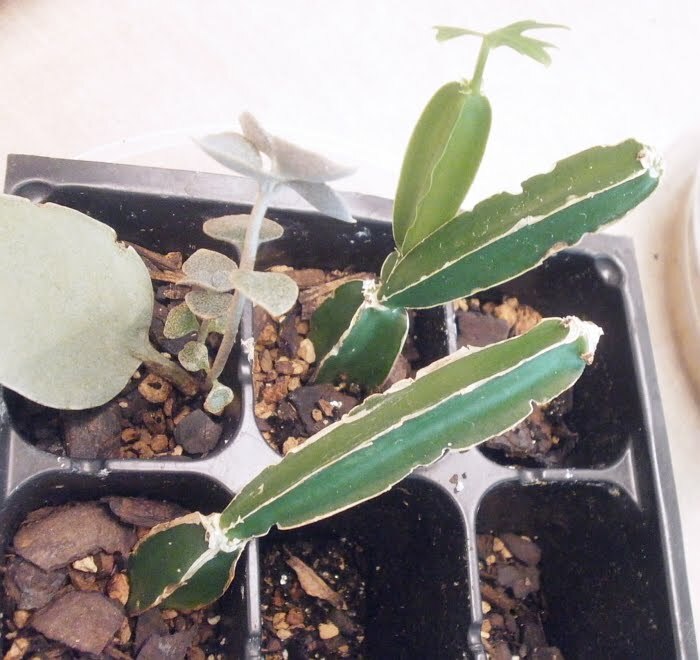 I may have to find someone who wants cuttings now, just to give it a try. I mainly ship orchids and if possible I ship them potted if I grew them potted (instead of mounted). To hold the mix, mainly bark, in the pots I use toilet paper instead of tape or tin foil. I roll it and stuff it into the pots where I can see the bark, make the layer a bit higher than the rim of the pot and use rubber bands to secure it. Next I tape the pots to the box and prefer plastic bags to fill the box. This box goes into another box which I stuff again with plastic bags. 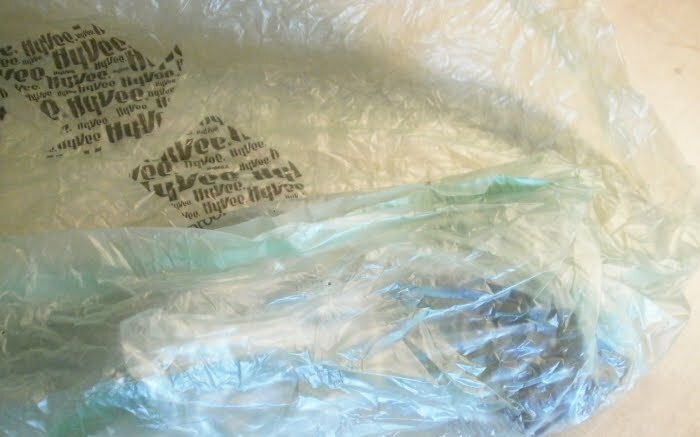 I had more success using plastic bags than shredded paper, seems that the materials inside stay better in place this way, plus plastic is gentle to the leafs. I only ship within Europe (no restrictions as far as I'm aware of). As an aside: I briefly worked for a major packaging shipping company, and as far as I know, you can write "fragile" "Perishable" or "Live plants!" all over your boxes as much as you want, and they won't be handled any differently than any other box -- and that is to say, not too gently. Now we just need to make a thousand copies of this and send them out to each and every nursery! Thanks for the heads up about watering the plants adding to shipping costs. Now I know why everything I receive needs immediate watering. Maybe my far-off location has something to do with it? Blue tape contractors use comes off easier and doesn't leave adhesive on the pot. You can use cardboard tubes from tp, paper towel, wrapping paper, etc. as sleeves for fragile bagged bareroot plants and cuttings. Save 'Juice box' type containers for soy milk, etc. Unfold the glued-down triangle 'ears' on the top and bottom, cut off the top and wash out. One can hold two square 2-1/2" 'rimless' pots or one 3" pot. To remove the plant, cut off the 'ears', then the glue seam on the bottom, then slide out pot first. Also good for protecting plants in bags, like at plant sales. And the plastic bags stay inflated during the trip? (I assume we're talking about the sort you get at fish stores, the sort of long, narrow ones, not grocery bags) Definitely an interesting way to go -- and it sort of serves as its own padding, then, I suppose. 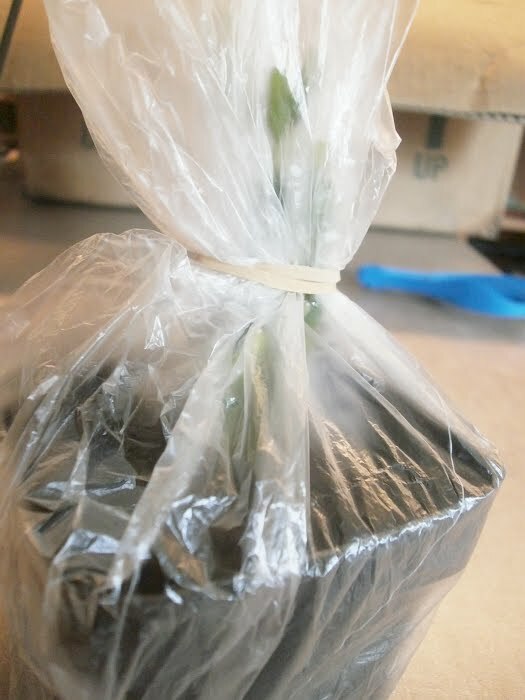 Yeah, I've definitely gotten plants where they were going using shredded paper, but plastic bags seem gentler, somehow. It's worth noting that every company I've ever gotten anything from by mail always uses paper, usually shredded paper inside a stiffer paper sleeve, and then with crumpled stiffer paper in the box to hold the plant in place. Though that's possibly because large quantities of new plastic bags are expensive. Or so I've been told when I've worked at grocery stores. I'd always suspected as much. I'd assume the shipping time has more to do with it than the weight. Though -- do you know if your plants are usually flown in? 'Cause if they get there by plane, it should take about the same amount of time, really. Or at least it's not immediately obvious to me why flying something to Alaska would necessarily take longer than flying it to Bangor, ME or wherever. How long does it usually take to get stuff if you have it shipped from the continental U.S. into Alaska? I'd wondered about that, or masking tape. I've never seen it actually used, that I can recall, but it made sense in theory. So thanks for confirming. 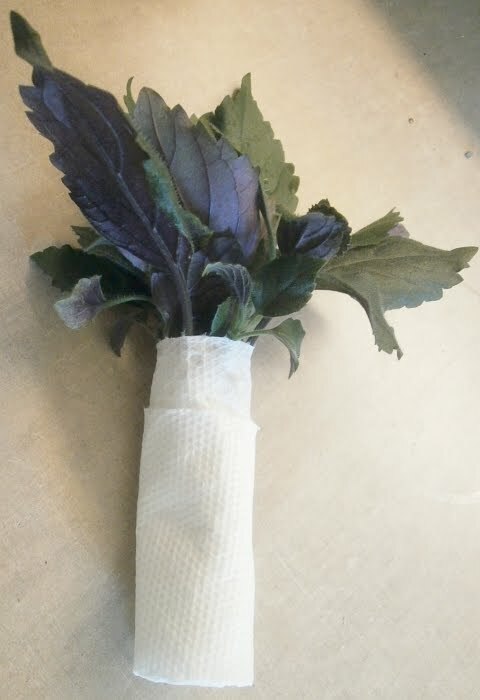 I have, once or twice, used paper-towel or toilet-paper rolls as plant sleeves, though usually the plants are too big or too fragile to fit in one. I also used a mailing tube for plants once, which apparently worked, but I don't know if it worked any better than anything else. Also, the tip about juice box / soy milk containers is gold. We've got soy milk containers all over the place here, so that will be very useful. Gollygeewhillikers! I'm so excited that I can actually contribute something helpful! In the upper right corner click "My Account"
You'll get to a sign in page that has a button for "New Users"
You'll need to establish an account with a credit card, but from then on, you can print your own mailing label and the postage will be charged to your credit card. You also save a little (7% springs to mind) on the price of the postage. And you don't have to stand in line and you don't have to talk to anyone! It's really easy, but you do need a postal scale. (Unless you use the Fixed Rate boxes, then you can just guess.) I got one from Amazon for about $20, but I'm sure you can find them more cheaply with a little searching. It weighs items up to 20 lbs. By having established an account, it becomes extremely easy to order the free mailing boxes. You'll find a link on the usps website marked "Order Supplies" and the boxes will be delivered to your mailbox. In Mr_S's case, there would be a bundle waiting for him at his Post Office a week or so after he ordered it. The boxes are excellent quality, white, and clearly marked Priority Mail so that they stand out from all the brown ones. Yet another awesome post that I need to save for future use! 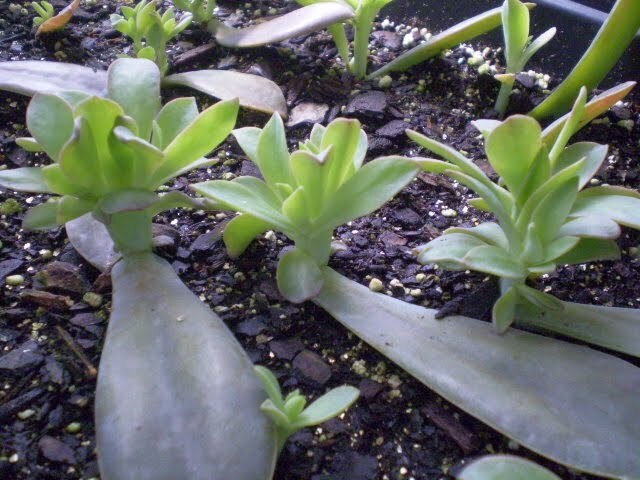 I've sent plants the wrong way before to no ill effect, but those were just bromeliad pups. I'll probably make my own "Rainforest Garden" mailing labels with preprinted warnings on them too!